Welcome to Salt Creek Spa. For several years we’ve refurbished, developed and expanded Salt Creek Spa – everything to offer our guests an experience worth remembering. That’s also why we can call us the most attractive spa-alternative close by Österlen and Malmö, which we are very proud over. Whether you’re visiting us for a romantic stay-over, a weekend with friends, a whole day at the Spa or as a conference guest – Leave your troubles on the parking lot and let us take care of you. We offer exciting packages for both private and conference guests, a wide range of different treatments that is developed just for your well being and an environment that encourages reflection – Well, days with a silver lining simply. A visit at Salt Creek Spa is a full body experience for both body and soul! Our location, right by the sea is magical and makes a fantastic background for our equally amazing Spa. Inside, in the middle of the Spa, you’ll find our heated swimming pool, jacuzzi and sauna. Need to cool down? Just take a dip in our indoor ice-hole. Through a glass door you’ll reach our asian inspired warm low-water pool with a soft undercurrent, right in front of an open fire. For you that’s more into the steam sauna, you’ll find these in respective changing rooms. Outside we have four hot springs, two of each side of the large pool house. Also outside, with its own path down to the ocean, you’ll find our lovely dry sauna with an amazing view over the open waters. Here you’ll find a distinct smell of peppermint that has an uplifting effect on your body. Upstairs, you’ll find the relax. Two separate rooms with big, cloudy beds that encourages moments of relaxation and reflection. The brighter room, Seaview, has an amazing view of Östersjön, while you in Fireview listen to the cracking from the fireplace in the middle of the room. 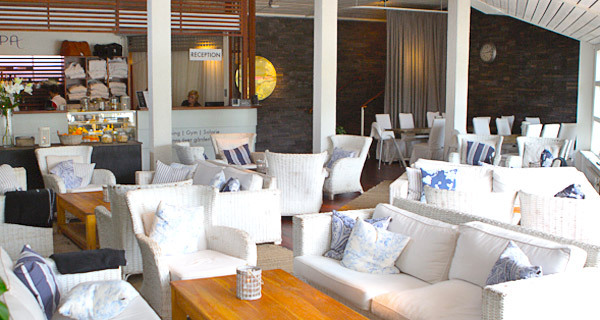 At a convenient distance, there’s our Captain’s Bar where you can treat yourself to a drink between 15:00 and 22:00. So what are you waiting for? We look forward seeing you at Salt Creek Spa! A full-body treatment combines a whole host of experiences for every sense. If you have any questions, please contact spa@ysb.se or +46 411-13633. Please include your name and phone number in your email.